With all of your historical round statistics compiled into the Stats section of the app, use this article to help better understand what these statistic charts and graphs mean and how you can use them to improve your game! This chart represents your total gross score for each round you play. Your scores are represented by the blue bars and the black line is your trending average score. All averages are based on 18 hole rounds, so any 9 hole rounds that are completed in the app will be reflected as an 18 hole average. This pie chart represents the average number of Birdies or better, Pars or better, Bogeys and Double bogeys or worse you’ve scored in your past 5 rounds for free golfers or within the selected filters for Premium Members. This bar chart shows your hole scoring average for Par 3, Par 4 and Par 5 holes in your past 5 rounds for free golfers or within the selected filters for Premium Members. The number above each bar represents your average for that type of hole. This graphic represents your average performance for the four target categories against your average target goal. This is shown for the past 5 rounds for free golfers or within the selected filters for Premium Members. This bar chart shows the average putts taken per hole during a round for the past 5 rounds for free golfers or within the selected filters for Premium Members. An average of 2 putts per hole is a great place to start. Shoot for 2 putts per hole or less to improve your total round scores! This chart shows your average percentage of hitting greens in regulation. This is shown for the past 5 rounds for free golfers or within the selected filters for Premium Members. This chart shows your average spread variation off the tee. Fairways hit will be represented in the middle portion of the chart. Fairways missed to the left or right will be represented on either side of the chart, respectively. This is shown for the past 5 rounds for free golfers or within the selected filters for Premium Members. This bar chart represents the amount of successful sand saves recorded during a round. This is shown for the past 5 rounds for free golfers or within the selected filters for Premium Members. What is a Sand Save? Sand save percentage is calculated by the number of times a player is able to get up-and-down from a greenside bunker, regardless of score. This bar chart represents the amount of successful up & downs recorded during a round. This is shown for the past 5 rounds for free golfers or within the selected filters for Premium Members. What is an Up & Down? An Up & Down in golf is a stat that is defined as taking only two strokes to get the golf ball into the hole when your ball is resting around the green. This bar chart represents the amount of penalties recorded during a round. This is shown for the past 5 rounds for free golfers or within the selected filters for Premium Members. This bar chart represents your win/loss history by round. This is shown for the past 5 rounds for free golfers or within the selected filters for Premium Members. A red (or negative) bar result represents bets lost; a green (or positive) bar result represents bets won. Driving Distance - Track those shots! Premium Members will also be able to compare these hole-by-hole stats to different handicap groups, just as you can with strokes gained stats! 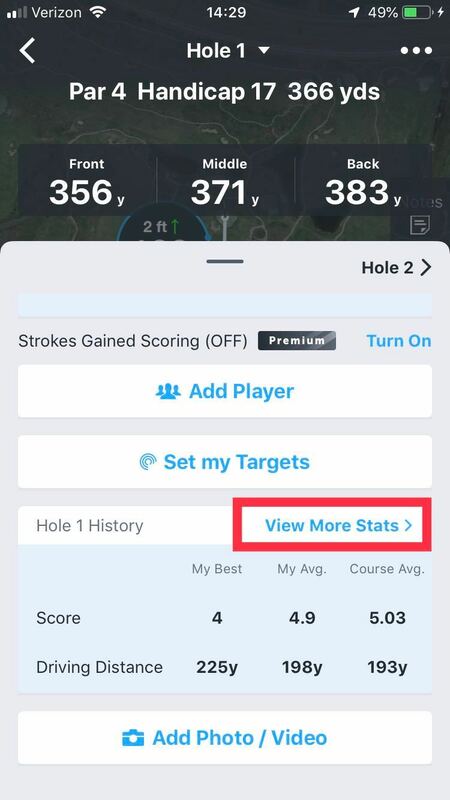 Swipe down on the scoring screen to the ‘Hole History’ section (highlighted in red in the screenshot below). 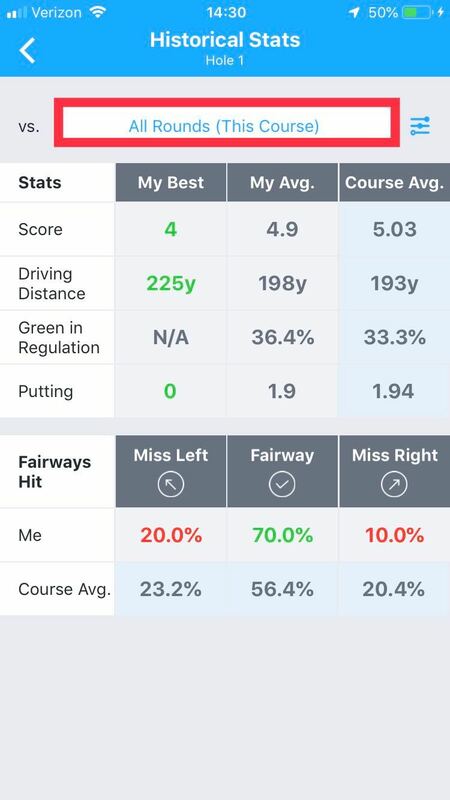 View your personal best, personal average, and compare to the course average of all rounds played at this course - Premium members, press the “.vs” field (in the red rectangle below) to set your performance comparison to different handicap groups.